Thermostatically controlled. 3 Chrome wire shelves, removable. 4 Castors - 2 braked. Plate capacity: 270 x 25cm or up to 40 plated meals. 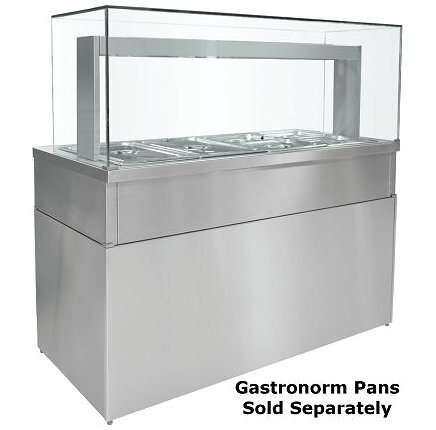 Parry 1894 Mobile Servery with Bain Marie Top. Thermostatic control. 2 x Simmerstat controls to bain marie. 2 Chrome wire shelves, removable. 4 Castors - 2 braked. Gastronorm capacity 4 x 1/3 - D150mm (Sold seperately). Optional choice of gastronorm configuration. Plate capacity: 120 x 25cm or up to 20 plated meals. 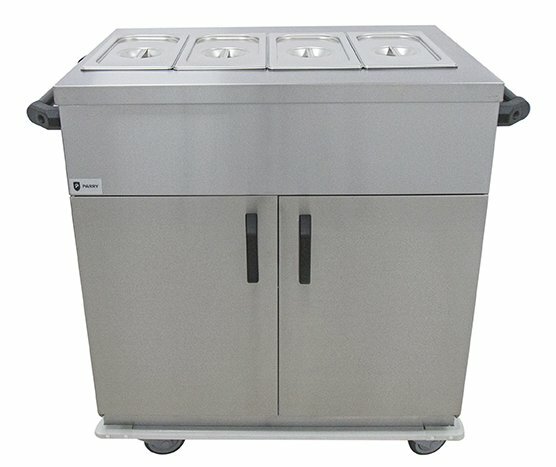 Parry 1887 Mobile Servery with Bain Marie Top. Thermostatic control. 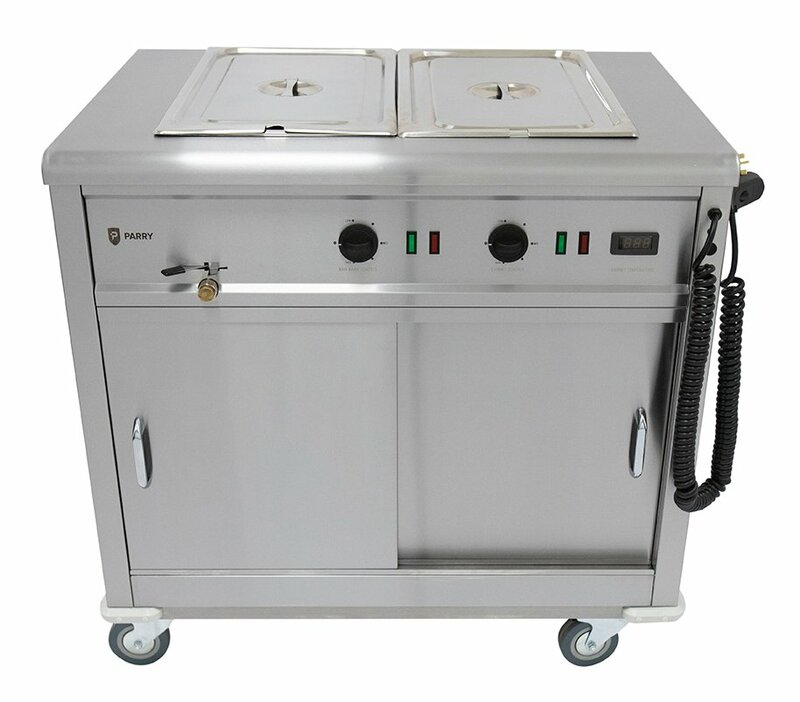 2 x Simmerstat controls to bain marie. 2 Chrome wire shelves, removable. 4 Castors - 2 braked. 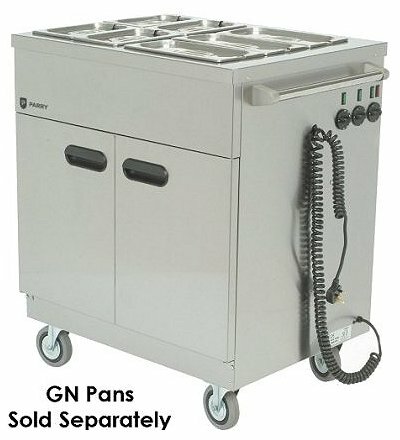 Gastronorm capacity 3 x 1/3 & 4 x 1/4 (Sold seperately). Optional choice of gastronorm configuration. Plate capacity 240 x 25cm or up to 30 plated meals. Stainless steel. Corner bumpers. Removable doors. Radius edges. 4 Castors, 2 braked. 2 Internal adjustable shelves. Digital temp display 30-85C. Plug park. Power 13amp plug. Heavy duty lockable door. Insulated. Holds 20 x 1/1 GN with runners supplied. (Shelves NOT supplied). Temperature controlled. Detatchable element. 4 Swivel castors, 2 braked. Bumpers to all 4 corners. 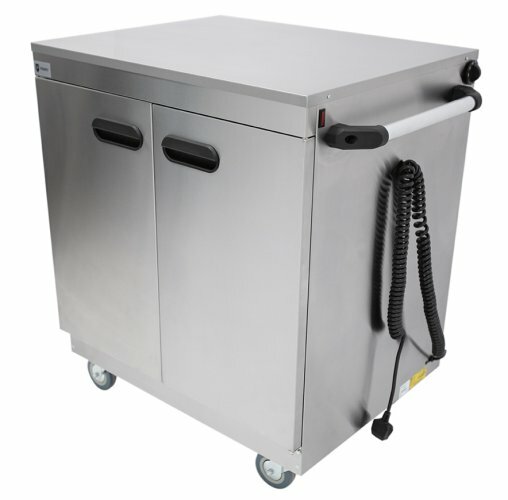 Designed to keep large quantities of plated meals in ready to serve condition when transported away from the kitchen. 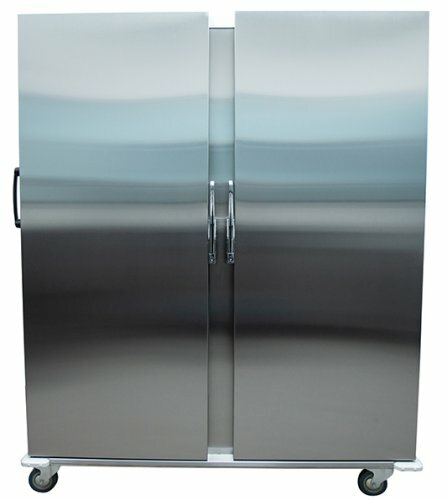 High grade double skinned stainless steel. Heavy duty lockable door. 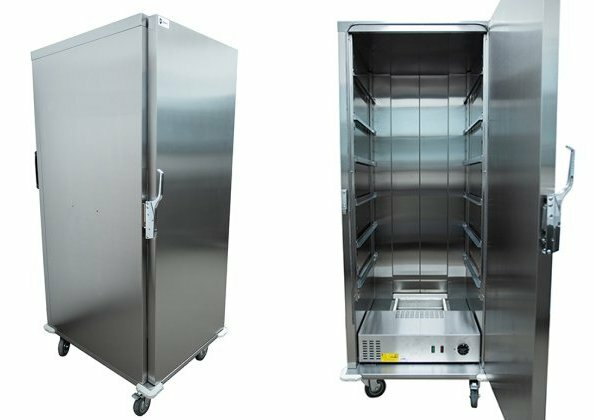 Designed to keep large quantities of plated meals or 40 x 1/1 gastronorm pots at safe, ready to serve, temperatures. Thermostatically controlled and fan assisted. Water reservoir to aid humidity. 20 Sets of removable shelf runners, hold 40 x 1/1 gastronorm pans 100mm deep, each shelf holds 2 pans. 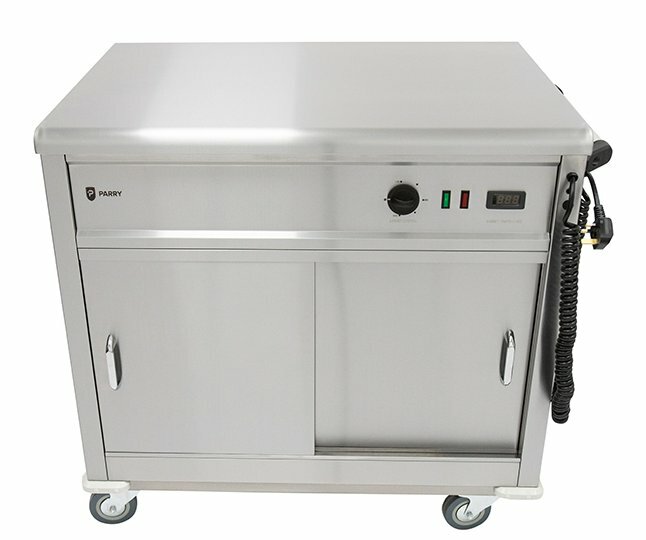 Please note: this unit will not cook food, it is just a holding cabinet to keep plated meals warm. Gastronorm pans not included.